What’s the Cost of Dental Implants in Columbia? Dental implants are a wise investment in your oral and overall health, but they do come at a higher cost than other options in tooth replacement. The total price of a dental implant procedure depends on a few factors — like how many teeth you are missing, where in the jaw they are located, and others. Many patients must have a preliminary bone grafting procedure performed first, which increases the volume of the bone and adds to the overall cost of the treatment. How can you find out exactly what you can expect to pay for dental implants in Columbia? Keep reading for a few tips on how to get the info you need. 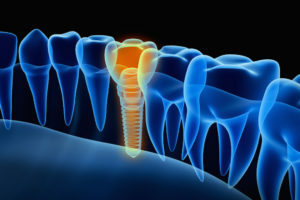 The only way to know for sure how much your dental implants will cost is to visit with your implant dentist. It is difficult to get an accurate estimate over the phone, as your dentist will not be able to really consider the individual factors that may affect the price of your dental implant procedure. During a dental implant consultation, your mouth will be evaluated to determine whether or not you are eligible for dental implants, and what your procedure will entail if so. After this information has been collected, your implant dentist can give you an accurate estimate for how much your dental implants will cost. How many teeth you are missing: Each implant post is priced individually, so the extent of your tooth loss will have the greatest factor on the cost of the procedure. Where in the jaw the teeth are located: Replacing front teeth requires special considerations for aesthetics, which makes them more expensive to replace than molars or premolars. How healthy your jaw bone is: A bone graft or sinus lift will improve the health of the jaw to create a proper environment for dental implants — and they increase the cost of the procedure, too. Anesthesia: More complex cases may require general anesthesia and other special considerations, which cost more. After you have a good idea of what you can expect to pay for your tooth replacement, you and your dentist can discuss ways of making them fit in your budget. Dental insurance usually will not cover the dental implants, but you may receive discounts on individual parts of the procedure, like the denture or crown that restores the implant posts. Financing options may also be available through CareCredit. Whatever the price, dental implants are worth it for a sturdy, long-lasting tooth replacement that benefits oral and overall health. Dr. Philip Batson is a trusted restorative dentist serving friends and families in Columbia, MO. Truly dedicated to providing high-quality dentistry, Dr. Batson is the current President of the Missouri Academy of General Dentistry. To learn more about his services or to discuss dental implants in more detail, do not hesitate to get in touch by calling 573-875-7071. Comments Off on What’s the Cost of Dental Implants in Columbia?